The Arts & Lifestyles pull-out section published this piece in print on Oct. 27, 2016. 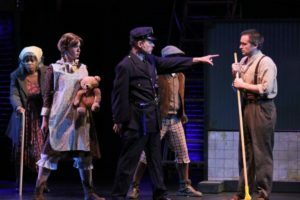 “Urinetown: The Musical,” currently in production at the Smithtown Performing Arts Center through Nov. 6, has received rave reviews. The two lead characters, Hope Cladwell and Bobby Strong, are played by real-life couple Samantha Carroll and Jeremy Hudson. I sat down with the two actors on Saturday night before the show to ask them about their latest roles. J: She Facebook stalked me throughout college. S: I just was like, “I read with this guy and he’s nice.” We became closer friends at the Engeman. We started doing children’s theater there together and he was in a production of White Christmas that I was a dresser. J: Even before that though — Little Women. S: Oh god yeah, and then we did Little Women together at CM. Our friendship and love, eventually, has come through working at all these different theaters. But we did actually meet at the Smithtown Center for the Performing Arts years ago. And here we are. J: It was a long time ago. 2007. 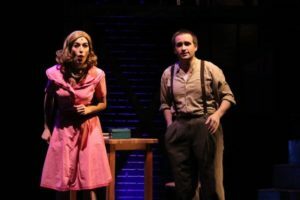 Samantha Carroll and Jeremy Hudson sing ‘Follow Your Heart’ in a scene from ‘Urinetown The Musical.’ Photo courtesy of SCPA. What is it like being engaged to each other and starring opposite each other in a show? S: I mean, it’s like any other day really. We met doing shows together so I guess it’s normal. It’s easier to learn the lines. I trust him on stage. Our families are even more excited than we are. S: We don’t know when it’ll come again to work together, so it’s very nice. What other theaters have you both worked in? S: Together, we worked at CM Performing Arts Center in Oakdale and the John W. Engeman in Northport. This is definitely our biggest roles together. Playing opposite each other is really, it’s silly but we’re both serious enough that we don’t just burst out laughing. J: We can keep it together for five minutes. You said that you performed at this theater in a teen production. Have you done any other shows here? S: I have. I’ve been here my whole theater life. I’ve done many of the Wonderettes shows — they’re doing another Wonderettes coming this May and June. Light in the Piazza was my first really big one. Most recently, I’ve been in Violet, which was a really big favorite, and we were both actually in First Date together a few months ago as well. J: Last March. More than a few months at this point. S: But yeah, I was in Little Mermaid. The list goes on and on. And Jeremy’s worked here before as well. J: I haven’t done quite as much but I have done a few shows in the past. I did Assassins here, I did Dirty Rotten Scoundrels. Bloody Bloody Andrew Jackson was another one I did here. 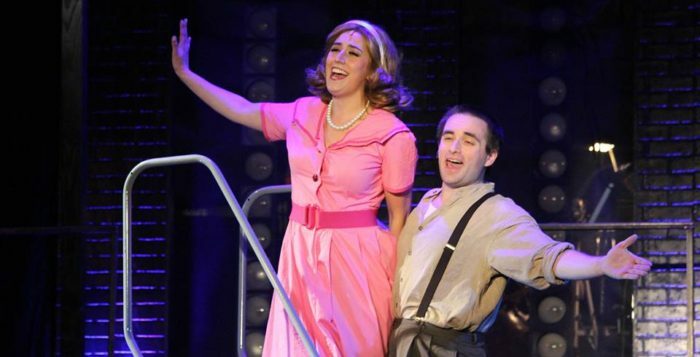 Samantha Carroll and Jeremy Hudson in a scene from ‘Urinetown The Musical.’ Photo courtesy of SCPA. How old were you each when you decided that you wanted to be an actor? What attracted you to the profession? S: I think I was probably about 6 or 7 when I started to be interested in it. My mom took me to see Beauty and the Beast on Broadway and at that point I was like, “Oh, well I have to be Belle.” I mean, I’m still waiting. I think my first acting class was probably at 8 years old and then I started singing lessons in sixth grade, so once I got to high school, I realized that this is what I want to do for the rest of my life. Beauty and the Beast, those princesses and those villains, inspired me to be where I am. J: And I was in high school, I guess. My brother — my older brother, 10 years my senior so much older brother — used to do theater and growing up I would always go with my parents to see him do shows pretty consistently, so it was always kind of a part of my life. And then I did one myself and I was like, “Hey this is fun.” My first show was Grease, and then Guys and Dolls. I just enjoyed doing it, and having been a part of it my entire life, I just kind of slid into it myself. Do you ever get nervous on stage? S: For sure. Nerves are good, though, because it means you care about it and it keeps you focused. J: The thing is, I forget there are audiences there, so I just am doing it and because I’ve done it so many times now, I’m used to people watching me do whatever. The only time I get more nervous, so to speak, is if I start to really think about it. Sometimes I’ll be on stage doing a scene and, not to say I won’t be in the moment, but I’ll just think, “I’m standing on a stage and there are people staring at me.” And then at that point what I’m doing starts to sink in, and then maybe at that point. S: We don’t stay up at night thinking how terrifying it is to be on stage, or we wouldn’t do it. I think we get just general butterflies, especially when your parents are in the audience. You just want to be good. We’re perfectionists, unfortunately, to a fault. 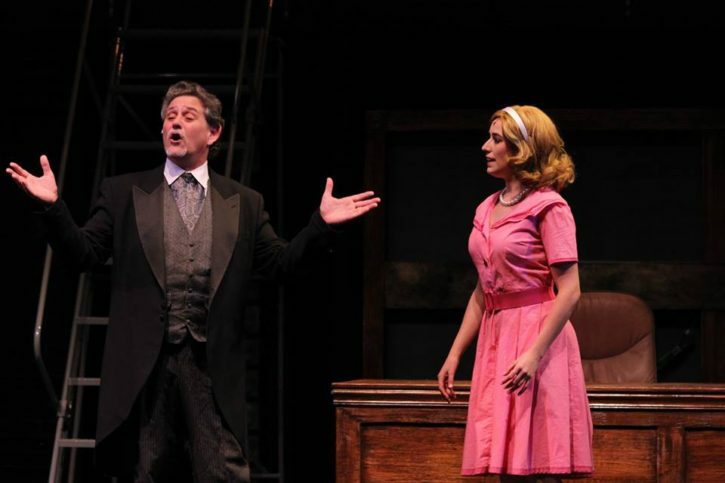 Samantha Carroll in a scene from ‘Urinetown The Musical,” Photo courtesy of SCPA. What is it like watching each other perform? S: It’s so cool. I do some stuff in Millbrook Playhouse in Pennsylvania, and Jeremy has come out to to see me in everything. I always just wait to hear what he has to say, because those mean the most to me. His words and his critiques, he doesn’t have many. J: Not to her face at least. S: And seeing Jeremy is amazing too. I got to see him in 1776 last year. J: You don’t get to see me do as much as I see you. S: He sees me a little more because he works a big-boy job too. J: One of the many reasons we’re going to get married is just because it’s nice to share similar interests in this because it is a very time-consuming, very all-encompassing profession. Being an actor or actress takes a lot out of you, so to be on the same page and to have that point of reference or common ground, so to speak, between the two of us is good. What is it like when you get a standing ovation? S: It’s not expected, but it’s very nice when it happens. J: It’s good that an audience is that invested because it takes a lot to sit through a show, even a show you like, and then feel the need to stand up and show your appreciation for it afterwards means a lot. Has anything strange ever happened out in the audience that you noticed while on stage? J: All the time. People on their cell phones, people falling asleep. S: Choking. We’ve done so much children’s theater together, the kids are, you know, they just scream the whole time. We’ve seen it all. J: Audiences feel like because they’re sitting in a dark theater that people don’t see them. But lo and behold, being on stage you see everyone and everything. I look out and scan the audience every once in awhile. If you’re doing something weird, I will see you, and we will be talking about you. Being an audience member requires just as much investment as being a performer on the stage. It’s why I don’t like sitting in the front row myself because I feel like I’m a part of the performance as well, because the actors can see you. They can see you throughout the show. S: And they will look at you. It’s actually easy to see the front row, but a lot of other rows are harder to see. It depends on the cues, but you can always see the first row. Jeremy Hudson and cast in a scene from ‘Urinetown The Musical.’ Photo courtesy of SCPA. S: Currently — they change all the time — I would love to be Alice in Bright Star who was played by Carmen Cusack on Broadway. And I would die and go to heaven to be anything in Waitress. J: I mean, who doesn’t want to be in Le Mis, but I would like to play Jean Valjean in Les Misérables again. I did it in a teen production ten years ago, so I would like to do that again in a real production. That would be fun. Do you have theaters in mind that you want to work in? J: Anything between 7th and 8th Avenues between 42nd and 49th Street would be great. S: Any theater that’s going to be professional and lovely, we would love to work at. 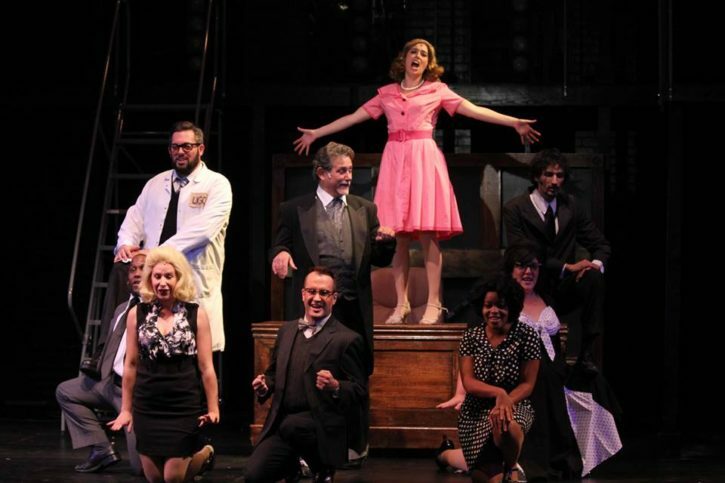 What attracted you to “Urinetown the Musical” and what made you want to audition? S: I actually did “Urinetown” at the same theater 10 years ago in the teen production and I played Hope — the same part. 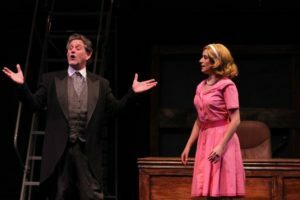 I found out they were doing it again and Ken [Washington], the director, had talked to me about if I would like to reprise my role but on the main stage. I said absolutely. It’s a strange show, but it’s very funny and I like to be Hope so I wanted to do it again. J: I saw the actual show 10 years ago and I have always liked it and wanted to be a part of it. It’s always been on my short list of shows to do, so I’m glad I’ve gotten the opportunity to do it at this point. S: I have worked with Ken since I was 16 years old and he has seen me grow up. He is still the fun, grumpy man I remember he was, but you know, I think Ken has such a passion for theater. It’s definitely rubbed off in a good way. We love Ken. J: He cares a great deal and he has a wealth of knowledge as far as theater goes, so it’s definitely something that is good to tap in to from time to time. What is it like working with the cast? S: Well, this cast specifically is a lot of, as we like to say, Long Island notables, just people who have kind of been doing this for such a long time. We’re very luck, honestly. A lot of big personalities, but in a really great way. J: It’s a very eclectic group of people. All bring individual strengths [to the stage]. What is your favorite scene and song in the show? S: My favorite scene and song is definitely “Follow Your Heart.” I’ve always loved it. “Be still, Hear it beating, It’s leading you, Follow your heart” was actually my yearbook quote for high school. It’s funny, it’s heartfelt and I get to do it with the best partner in the world. Michael Newman and Samantha Carroll in a scene from ‘Urinetown The Musical.’ Photo from SCPA. J: I enjoy the scene leading up to “Run Freedom Run!” and that song. It’s just fun because it’s a bunch of strange people and it’s just very funny. It’s 80 percent the same every night and 20 percent slightly different, which always keeps things interesting. S: If you ask any theater person at all, they’ll say to you, “‘Urinetown’ is the best,” or, “I love ‘Urinetown’.” I’ve been in it three times. 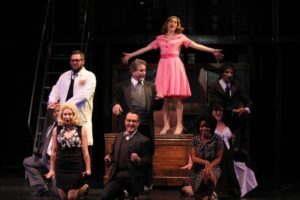 It’s just one that people who don’t usually come to see theater don’t always come to, but they really should because it’s very, very funny. Hilarity ensues. What is up next for both of you? S: So he can make the dollar bills. It’s honestly either just you’re doing three shows at a time, one after the other, or you don’t do something for six months. J: As long as we can make a living, or any wage, really, performing, that is the ideal. I would love to do theater but that doesn’t necessarily mean that’s the only thing I would like to do. S: But we’ll always do it, regardless of if we have babies or have full-time jobs, we’ll definitely always come back and do theater because that’s what we love. 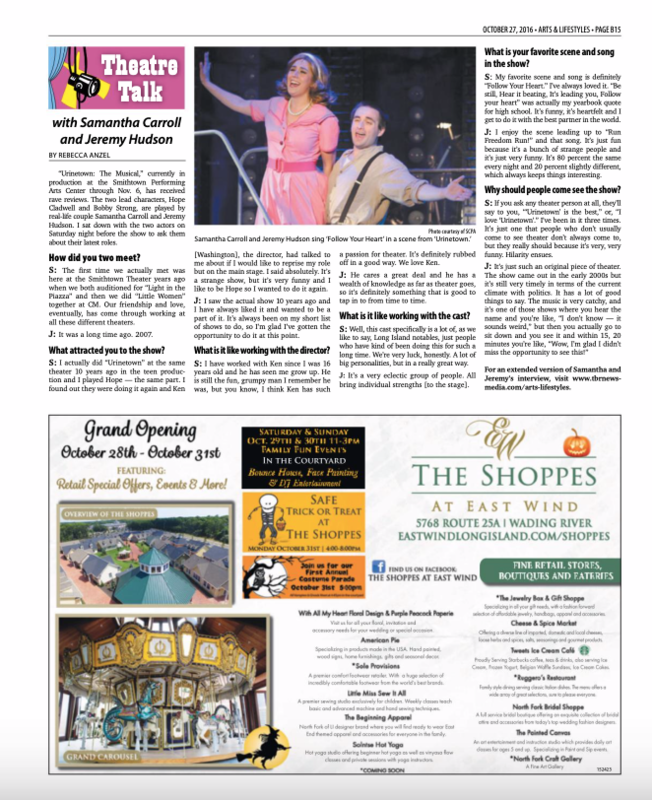 J: This is a wonderful show, here, and Smithtown Performing Arts Center. There is a theater in Smithtown, it’s on Main Street. S: Please come see Urinetown and everything else because everything they do here is really wonderful. J: They put a lot of time and effort and thought into shows here. This is specifically a show that desperately needs an audience to enjoy it for it to really reach its maximum potential, so come on down everyone. 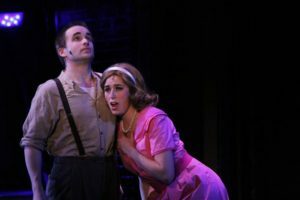 Samantha Carroll and Jeremy Hudson sing ‘Follow Your Heart’ in a scene from ‘Urinetown.’ Photo courtesy of the SCPA.